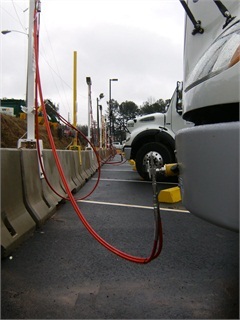 Many fleets and municipalities are not making a commitment to use natural gas as a transportation fuel because the fleet managers do not have enough information to accurately estimate the total cost converting to CNG including CNG vehicle conversion, CNG fueling station development and all other tasks and costs associated with the process. An article below does a great job painting a big picture and we are glad to share it with you, our customers and subscribers. Please do not hesitate to contact us for a feasibility study applicable for your particular fleet. Converting vehicles to run on compressed natural gas (CNG) has some clear and immediate benefits. From the beginning, fleets that rely on CNG can expect lower fuel costs, cleaner running engines, lower maintenance costs, and fewer emissions. For these benefits, however, fleets pay a price. At first, the costs of CNG conversion seem just as clear as the benefits: purchasing new vehicles, converting old ones, and building fueling stations. But as fleets dig into the planning and implementation of a CNG program, other costs emerge. Five industry professionals share their experiences and shed light on the total costs of converting to CNG — and how to avoid budgetary surprises. The true costs of CNG can be broken down into two categories: capital expenses and operating expenses. Beyond the purchase or conversion of fleet units and the building of fueling stations, capital expenses include modifications to maintenance facilities, backup fueling stations, and station upgrades. ■ Modifications to Maintenance Facilities: Fleets that service their own vehicles need to make modifications to maintenance facilities — and before CNG vehicles come on board. Specific code requirements exist for facilities that service natural gas vehicles. 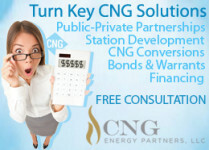 If your maintenance facility is old or outdated this effort can add few bucks to the total cost of converting to CNG. In order to safely accommodate lighter-­than-air fuel, maintenance facility upgrades include pressure gauges, leak-detection equipment, and proper ventilation. Without modifications, the CNG fuel system can’t be maintained or repaired inside the maintenance facility. 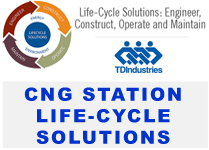 “Costs for the facility upgrades will vary dramatically, depending on the size of the facility, its age, and its current configuration,” said Richard Drake, P.E., vice president — engineering, ET Environmental, a CNG design and construction services provider. Modifications to maintenance facilities will also require updates to the ventilation system. CNG exhaust systems are considered “high temperature,” which are more expensive than older, low-temperature systems. For a basic hose drop system, including the fan, ducting, hose, and installation, fleets can expect to pay approximately $5,000 per bay (i.e., one exhaust drop for one vehicle). ■ Backup Fueling: Although many fleets have converted to CNG, fueling stations are yet to be widely accessible. That means fleets must have a strategy in place in the event of a power failure or equipment malfunction adding to the total cost of converting to CNG. A nearby public fueling station can be used as a backup. “We can fuel our fleet more efficiently by having our own station, but the public stations offer redundancy for us, should our system be unavailable,” said Elizabeth Relford, Weld County, Colo., transportation planner. ■ Station Upgrades: An agency may decide to expand its CNG fleet, but if fueling stations aren’t built with future growth in mind, station upgrades will be required to keep up with the fueling requirements of the larger CNG fleet. These likely include the purchase of CNG compressors, a dryer, additional storage spheres, CNG hookup, electrical hookup, engineering fees, dispenser upgrades, and assorted other minimal costs. ■ Training: CNG fueling systems are complex — which means an investment in training for fleet technicians is a must. “It’s important to set up the training immediately and have it completed before ­implementing your CNG equipment purchasing or conversion program,” Riley said. ■ Equipment Operation and Maintenance: When a fleet owner installs the fleet’s own fueling infrastructure, it’s important to account for the costs to operate, maintain, and eventually replace the equipment. 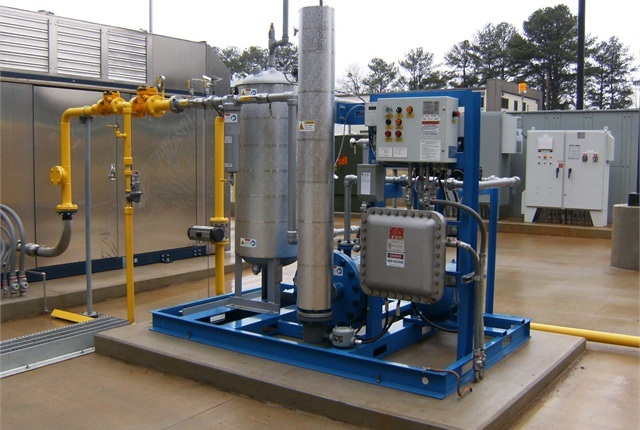 Compression equipment operating costs include electrical, CNG gas to run the compressor, and associated maintenance costs such as parts, oil, and filters. Riley said he was once quoted roughly $1,500 per month to service and repair a fast-fill compressor station with 20-foot cylinders. 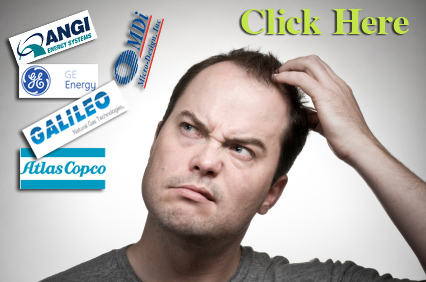 Tanks are required to be inspected every three years by a certified tank inspector. Relford said Weld County pays $150 for the inspection and approximately $600 for an 8 gasoline gallon equivalent (GGE) Class 4 replacement tank. A Class 4 tank has a life expectancy of 15-25 years before needing replacement. An immediate tank inspection is also required if the vehicle is involved in a car accident. Even though there can be unexpected costs associated with CNG, there are ways to better anticipate — and even control — them. ● What is the fleet’s ultimate goal? 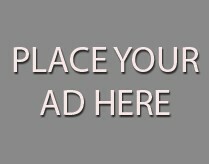 ● How many vehicles are realistically eligible for conversion? ● Do you want to replace older units with new CNG vehicles as part of your fleet replacement program? (This can result in a $6,000-$13,000 increase per vehicle). Once the costs are well understood, calculate the ROI to determine the true feasibility of the program. Despite all these costs, Drake said a close look at fuel costs can help determine if it’s worthwhile. “The single greatest operational expense our clients incur is fuel — when they can cut these costs by 30-40% or more, they find the capital expenditure returned in most cases under four years, and often much sooner, depending on the size of the fleet,” he said. ■ Calculate Conversion Costs: As part of the ROI analysis, fleets should take a close look at what the wiser investment would be: conversion or buying new. If considering conversion, it’s important to evaluate whether the vehicle’s lifecycle will be long enough to see the value of conversion. However, Relford underscores how it isn’t difficult to get value out of converted vehicles. Resale of CNG vehicles should be considered, too. If no infrastructure exists for public use, Riley says you’ll be hard-pressed to sell the vehicle — or get the resale value desired. 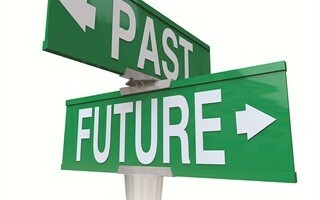 ■ Talk to Others: Part and parcel to doing your homework is talking to others and learning from their experiences. Fleets can benefit from working with a construction partner experienced in designing and building CNG systems — and who knows how to avoid unexpected costs. 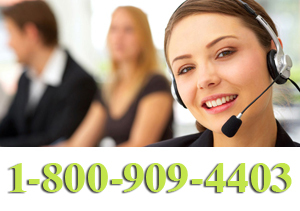 Communication with an exhaust system manufacturer can also help provide realistic costs. ■ Plan for the Long Term: Because the size of storage tanks determines how many vehicles can be fueled, it’s important to plan for the number of CNG units you’ll have in the long term, not the short term, when building a fueling station. “The worst thing you can do is undersize your station and not properly anticipate the demand and usage of your product,” Stevens said. ■ Know the Drivable Range: For CNG vehicles, Drake offers the important reminder: measurements of diesel gallon equivalents (DGEs) or gasoline gallon equivalents (GGEs) may not be exact. And, fuel economy is often slightly less on a CNG vehicle than on a diesel one. So where a vehicle may have driven 8 miles per gallon when powered by diesel, it may only drive 7.5 miles per gallon once converted to CNG. These factors could ultimately alter the drivable range of the vehicle — and for the purposes of route planning and infrastructure development, it’s very important to know the drivable range. To avoid problems related to the drivable range of the vehicle, Riley suggests only converting/­purchasing vehicles that remain and operate within the local area. Vehicles that remain on a set route, like garbage trucks or parking enforcement cars, make good candidates for CNG use. Even though the costs of converting to and operating CNG vehicles are a reality, fleets continue to see benefits, both in terms of budget and the environment. Beyond the budgetary and environmental benefits, fleets will also likely see the benefit of expanded CNG programs in the future. As the popularity of CNG grows, accessibility to fueling sites and access to more advanced technology will grow, too. ● Elizabeth Relford, transportation planner, Weld County, Colo.
● Steve Riley, automotive director, City of Coral Gables, Fla.
● Mark Stevens, fleet manager, City of Asheville, N.C.